Kheer is this beautiful, creamy, sweet Asian pudding made with rice, tapioca, or vermicelli cooked in milk and sugar. 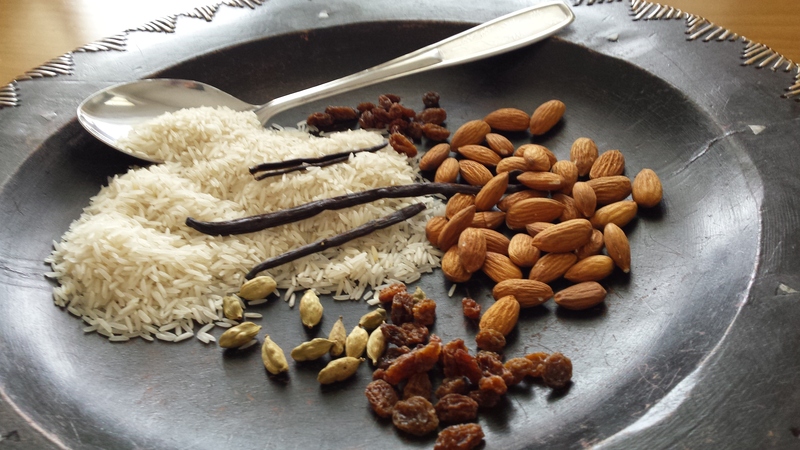 Kheer is usually flavoured with cardamom, raisins, coconut and saffron. It is a quick and easy recipe, it does not require any complicated cooking skills, and you can even use leftover cooked rice as well to make it. Kheer is usually made with long grain rice such a Basmati, but I once made it with Jasmine Thai rice and it was so flavoursome. The fragrance of Jasmine rice and the starchy consistency makes it very creamy and really nice…but by all means if your favour Basmati Rice the recipe is the same. Rice is a staple food in so many household and to combine it with aromatic ingredients I can only imagine heaven on plate. 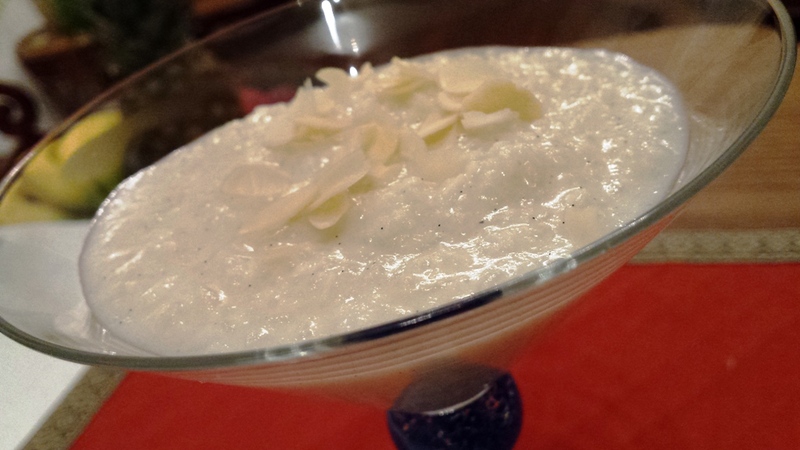 Rice Kheer is a special sweet usually made for any festival or celebration just like sevai. But it can be made anytime as well as a sweet dessert which can be served after meals. Now just imagine having Puri & Kheer for breakfast, I say bring it on – I love my rice and I could eat it everyday. Pour the milk into a heavy-based pan and heat gently. Add the ground cardamom, vanilla seeds and rice to the milk. Slowly bring to the boil then lower the heat and simmer rapidly, stirring from time to time to prevent the rice from sticking to the bottom of the pan. Add the condensed milk. When the milk has reduced by half, taste to check for sweetness and add sugar if needed. Transfer the rice pudding to a bowl. Add the chopped nuts, stir well, and leave to cool. Cover the bowl with cling film and cool in the fridge for a few hours or overnight. When ready to serve, spoon into individual serving bowls. Serve with a sprinkle of chopped pistachio and a spoonful of apple compote. In a large saucepan, combine the water, sugar, vanilla bean seeds, and cinnamon and bring to a boil. Boil gently until the sugar is dissolved and the mixture thickens slightly, about 5 minutes. Add the apple cubes and return to a boil. Lower the heat and simmer, stirring occasionally, until the apples are very tender. 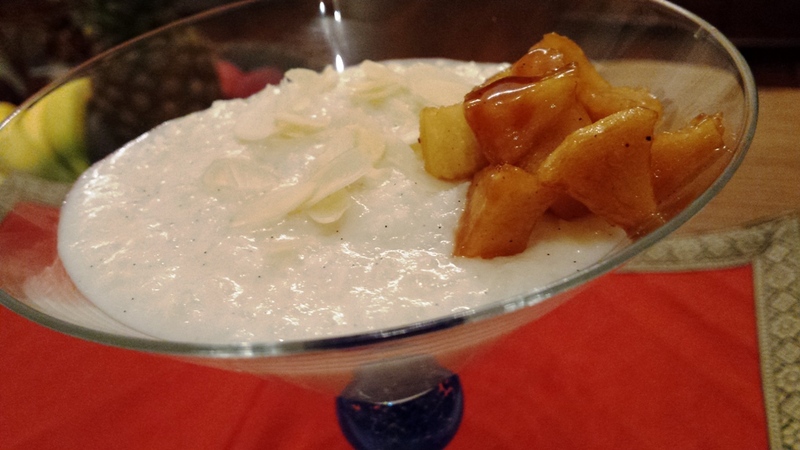 Brinda’s Note: Apple compote is optional as kheer is delicious on its own.